Will you be attending the race? 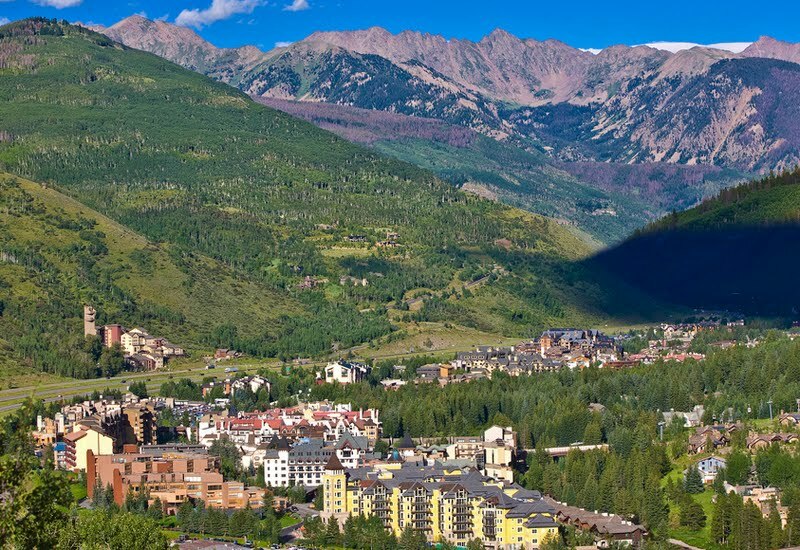 Want to know what will be happening in the towns you will be visiting during the tour in Colorado? I was curious myself about the special events planned in the local communities for the race. The events and links I was able to find are listed below. 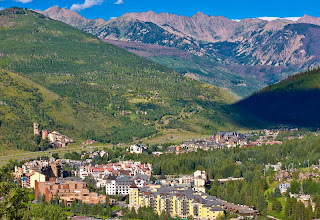 The cities of Colorado Springs, Crested Butte, Gunnison, Steamboat Springs and Breckenridge have lots planned for visitors and cyclists this year, (I am still searching for event information in Salida and Denver). Event activities: BMX track event, Ride of Champions, Kids on Bikes family ride, Bike Art, movies, Sprint Tournament, Crit Race, Hill climb, Fan Fest, Peoples Pedal Party with live music downtown, Gala dinner, amateur ITT, and more. Event activities in Downtown: Jumbotron TV, townie criterium, live music, beer garden, Day Expo, handcycling criterium. Event activities on Mount Crested Butte: Finish Festival, kids race, "Taste of Town", Jumbotron TV. 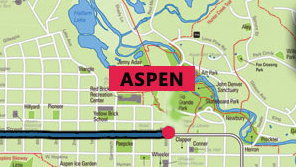 Event activities: Kids race off the official start line, Downtown Expo, Pre-start program of entertainment, Jumbotron TV viewing, family activities, live music, beer garden all day until the finish in Aspen. 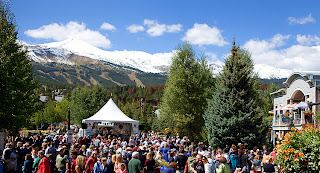 *Cottonwood Pass will close to vehicles at 5pm the night before the stage. Event activities: Lifestyle Expo, Citizen and Kids races, Women's Pro Criterium, Block party in town after the finish. Event activities: Citizens and kids rides, bike expo, chef challenge, starting ceremonies. 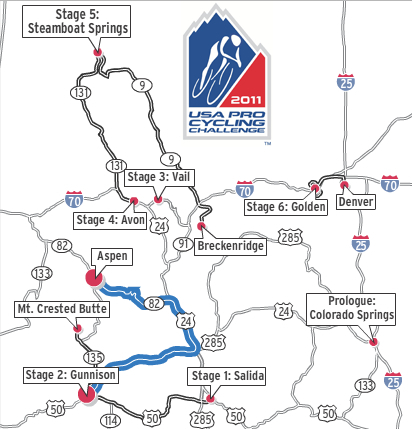 The Steamboat springs chapter of the international Jens Voigt fan club will be camped out on rabbit ears pass approx. 1.5 miles from the summit. All comers are welcome to stop by, have a brat, and make some noise for the man. They say they will be easy to find just look for a tall viking with the biggest Go Jens sign you've ever seen. Free beer if you wear your lederhosen! Event activities: Hand-cycling criterium, Kids race, parties, give-aways, live entertainment and more.There will be a street party and concert afterwards. *dogs are not allowed at the race site. Event activities: Golden organizers are planning a velo swap consumer bicycle event, a screening of the classic bike movie American Flyer starring Kevin Costner (based on the Coors Classic with scenes filmed in Golden), a wellness and sustainability expo, a block party/street fair, and a downtown cruiser paradium, kids' bike rodeo, and a citizens' hill climb from Golden to the top of Lookout Mountain. All of Civic Center Park will be fenced off as one big beer garden Sponsored by the official event organizers with music and expo tents. 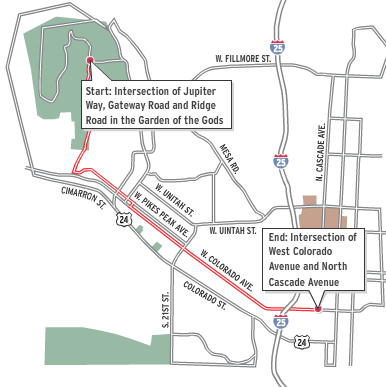 The race will complete 6 circuit laps around downtown along Speer Blvd and around the capital area after arriving from Golden. There will be a valet bike stall available to leave your bicycle, so ride your bike downtown. Metered parking is free on Sundays downtown. There will also be a separate "VIP" area located at Bannock and Speer sponsored by Diggity from 10:00am-3:00pm, with Free entrance, entertainment, give-aways, large screen TVs, beer from Left Hand Brewing Company, margaritas, and mimosas available (21+), and brunch from some of Denver's top Gourmet Food Trucks. Read more about this event at Diggity free VIP Event at USA Pro Challenge. In addition there is an event on Saturday, August 27th, 7:00-9:00pm, (the night before Stage 6) at Wheat Ridge Cyclery (owned by Ron Keifel) with hosts Phil Liggett and Paul Sherwen to benefit Bicycles For Humanity Colorado. Bring a bicycle to donate, or $25. More information: http://ridewrc.com/about/b4h-with-phil-paul-pg834.htm. And if you are interested, you can also play along at each stage: Geo-Caching Challenge: Download the Dot Biking application at DotBiking.com, available to both Android and iPhone users, and use it to locate and win prizes hidden along the USA Pro Cycling Challenge route for the duration of the event from Monday, August 22 through Sunday, August 28. For more information about the race see the PedalDancer.com Fan Information Page for the USA Pro Cycling Challenge. Or on the official USA Pro Cycling Challenge website.